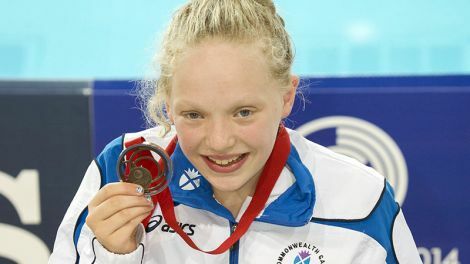 SHETLAND’S teenage swimming star Erraid Davies has become a “face” of the Glasgow Commonwealth Games after her bronze in the pool on Sunday, but she has worked hard for her medal success. 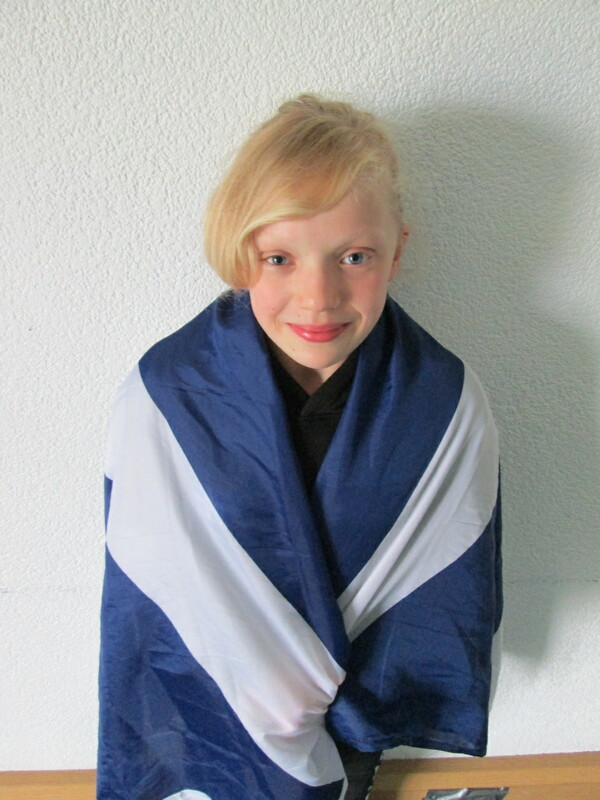 The youngest ever member of the Scotland team who was trending on Twitter briefly on Sunday night travels an hour and half to train for two hours at the Brae pool six days a week. The 13 year old moved to Shetland from Dundee at the age of four having just been diagnosed with the hip disorder Perthes disease. Stuck in a wheelchair for four years, doctors had immediately advised swimming as a way of exercising to strengthen the muscles around her hip. Parents David and Joyce say the youngest of their three daughters took to the pool like a fish to water and keeps them busy making sure she can train every day except Saturday, spending 11 hours in the pool a week as well as weight and circuit training. Her love of the sport was already shining through at the age of eight when she was Shetland champion for her age. One of her mentors was Felix Gifford, to whom she wrote a letter five years ago telling him how much she admired his skill in the pool. “She was already working hard to improve her swimming and I was someone for her to follow,” the 20 year old said, speaking from Aberdeen where he is training hard for international competition himself. Erraid was living in Sandwick at the time, but after meeting Gifford’s swimming coach mother Lorraine, who manages the North Mainland Leisure Centre, she started to train 30 miles away in Brae. Every school day she goes straight to the Brae pool from Lerwick’s Anderson High School where she studies, and is picked up at 9pm by her parents, who now live in Skeld. She also trains on Sunday mornings. Twice a month she travels to the Scottish mainland to compete against able-bodied swimmers at district and national level, often doing her homework on the ferry. Her hip condition means she still qualifies as “able-bodied” when swimming in competiton for everything but breast stroke, which is the style she claimed bronze in the 100m ‘para’ race in Glasgow on Sunday by beating her personal best by a full five seconds. 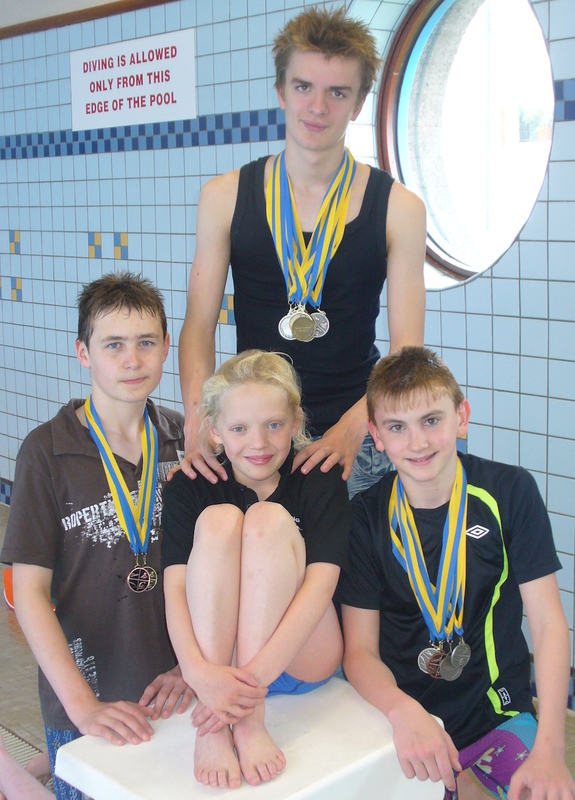 In fact it was only last year that she competed in her first national ‘para’ event in Edinburgh, and she won gold. It was an achievement that prepared her for Glasgow at the weekend, though she had no great expectations of doing well. “She didn’t expect to get a medal or anything like that, she was going to the Commonwealth Games for the experience of her first international,” Lorraine Gifford said. Gifford says Erraid’s success is largely due to her capacity to learn quickly and her dedication to keep practicing. “From the start you could tell her to do something with her stroke and she could do it straight away, and then work at it really hard until she got it right. Her son Felix said she always had a good technique and looked “a bit more professional” than the rest, but he believes it is also her positive spirit that has helped her get where she is today. “She always seems to be happy, there is never any negative energy from her,” he said, his mum adding that the 17 strong swimming club Delting Dolphins with whom she trains are like a family to her. 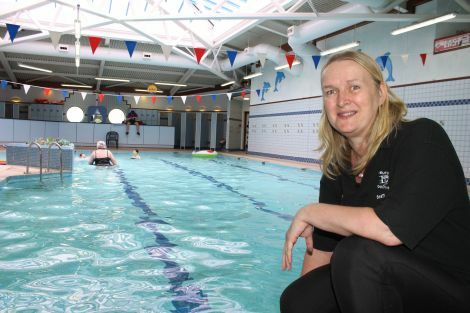 The pool where Erraid trains in Brae is just one third the length of the 50 metre pool she won bronze in on Sunday – in fact you could fit nine Brae pools into the Toll Cross International Swimming Centre. It is Shetland’s network of rural pools that her coach believes is responsible for the islands punching well above their weight in swimming competitions, with Andrea Strachan reaching this year’s Commonwealth Games final in the 50m breast stroke and Felix Gifford aiming for the 2018 Games in Australia’s Gold Coast. Erraid’s sights are now stretching even higher though – to the Paralympics in Rio de Janeiro in 2016, when she will still be just 15 years old. Having won the hearts of millions with her beaming smile as she mounted the medal podium, the pressure will be on the young girl to perform even better in the future. “This has really catapulted her into the international scene so she will be doing more competition for Scotland and probably Britain, in the European championships for instance,” her coach said. “But ultimately we have to start looking at Rio and hopefully she will get in that squad as well. “We have got to keep her grounded and tell her if she works really hard she could get to Rio, but I know she will work hard. Erraid will also be needing financial help to allow her to travel regularly to the Scottish mainland to train in larger pools against stronger competition, preferably by plane, though where that money will come from remains to be seen. Meanwhile the 13 year old is winning praise from all quarters, with messages of support locally from her head teacher Valerie Nicolson, from Shetland Islands Council vice convener Cecil Smith and Shetland MSP Tavish Scott, who submitted the following motion to the Scottish Parliament. Yet despite such accolades, there are still question marks over whether Erraid will be able to qualify for the 2015 Island Games, which has no “para” event or age group section. She will need to beat able-bodied adults to gain a place in the Shetland team for Jersey next year. You can see Erraid’s winning swim on BBC Radio Shetland’s Facebook page here.